They're an easy way to make your smart home devices play nicely together. Since Amazon's Echo arrived in late 2014, voice assistants have become increasingly important in making sense of the disparate smart home devices like speakers, light bulbs, thermostats, security cameras and more. But in the last few months, Alexa and the Google Assistant started letting users do multiple things -- like turning down the thermostat, lowering the lights and telling you what's on the calendar -- with a single command. It's been a key addition that has made managing a variety of different smart home devices easier. We tried out Amazon's implementation of routines back in October alongside new Echo hardware, but Google didn't launch its version until last month. If Google's going to keep Amazon from dominating the voice assistant market, it needs to be as good at tying a smart home together. If you've set up any smart home devices to work with the Google Assistant, you won't be surprised to learn that everything involving routines (and smart devices in general) is routed through the Google Home app for iOS and Android. The app's "home control" settings area lets you add devices from a wide variety of manufacturers. I tested it with a TP-Link light bulb and smart plug, an Ecobee 3 thermostat, the Nest Camera IQ and multiple Google Home and Chromecast devices. 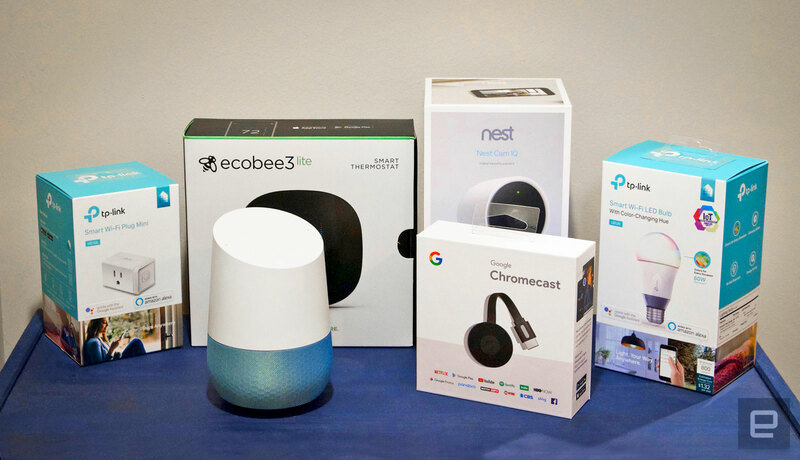 While the Google Assistant can control all of these, not all of them actually work with the routines feature -- you can't have the Nest Cam automatically start broadcasting its feed to a Chromecast, for example. Fortunately, the thermostat, smart plug and light bulb were all supported, along with a number of other Google services. Once I dove into the routine process, I encountered the first notable difference between Google and Amazon. With Alexa, you can build as many routines as you want, while Google offers a total of six customizable ones for specific times like waking up, going to bed or leaving the house. The Alexa app has one example to get started with, but otherwise it's a blank slate for you to customize. Beyond that, Google and Amazon offer very similar capabilities: you can control supported smart home devices as well as get information from Alexa or the Google Assistant. The first one I made was a variation on Google's "Good Morning". At the top of the routine's header, you choose what you want the key phrase to be — default options were "good morning" or "tell me about my day," but you can specify your own. From there you'll see a list of actions Google Assistant can do; unfortunately, some activities are restricted to specific routines. For example, the "commuting home" includes an option to send a text or read unread texts, but those aren't available in "good morning" or "good night." For most people, it won't be a problem, but it makes it hard to build a completely custom routine outside of the parameters Google laid out. The morning routine features a total of eight different actions. I customized mine to take my Pixel phone off of silent, turn on the light bulb (to a warm white light that wasn't too bright) and smart plug (which my record player and speakers are hooked up to) and turn up the thermostat. Then Google would tell me the weather, what my commute looked like, what was on the calendar and my reminder list. Once that was done, it set the "media" volume on my Pixel to 50 percent and started playing a news briefing from NPR. If you don't want to hear the news in the morning, you can also choose music from Spotify or Google Play, radio stations, podcasts or an audiobook. As someone with only a small set of smart home devices, I can't say that routines really reinvented my day. My smart thermostat is already programmed to my liking, so I don't really need it to be part of a routine. Smart lights, on the other hand, could be incredibly useful -- I've always liked having a dimmer, and being able to just tell my phone or Google Home to adjust the lights is pretty handy. (Not to mention changing the color to purple or green is just fun.) However, with a house full of recessed ceiling lights, changing all the bulbs would be an expensive and time-consuming project -- and it's not really solving anything. That's my issue with most smart home gadgets; I still feel like the majority are solutions in search of a problem. Many of these features were already available when using the Google Assistant as a "daily briefing" feature, but routines add the ability to tie in the many other smart home devices consumers might have. Assuming you've properly linked your smart home devices to the Google Assistant, controlling them is pretty easy. The Google Home app has handy settings that let you see what devices are connected and their status. And while this isn't directly related to routines, you can now string together a few commands in one go. You can say "Hey Google, dim my light and play Stranger Things on Netflix" and it'll parse both commands. This doesn't always work, and you need to use a Google Home speaker rather than a phone to recognize multiple commands. But it's better than having to say "hey Google" over and over again. 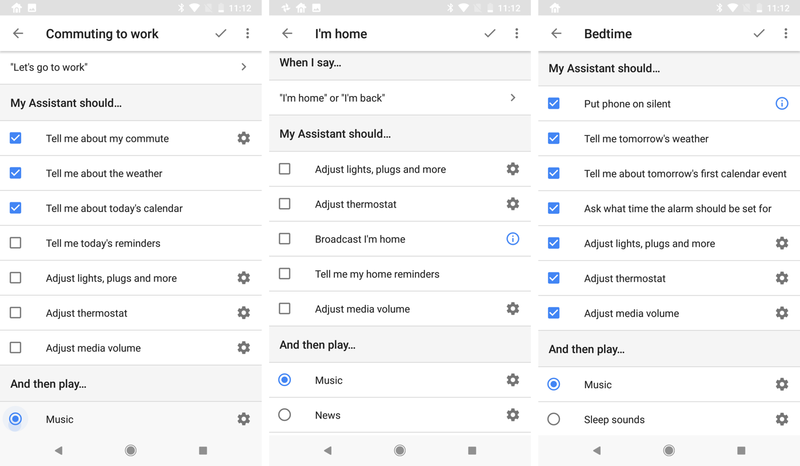 While Google's default set of customizable routines should make sense for most people, I wish the company had taken Amazon's approach of letting users craft their own routines from scratch (Google had nothing to say about future plans for routines). Having examples to get started makes a lot of sense, but people whose days don't quite fit into the neat boxes Google provides would benefit from more flexibility. There's no reason that sending or reading texts should be restricted to when you're commuting, for example. I generally work from home, so a commuting routine doesn't really apply to me, but I can think of several other scenarios in which I'd want to automate sending a text. On the other hand, this feature just rolled out, and it's not a stretch to imagine Google will iterate and improve it before long. When the Google Home first launched, there were plenty of concerns about Amazon and Alexa supporting more smart home devices, but that changed pretty quickly. Google's routines work well with many smart home devices, although it's not quite as flexible as Alexa. If you're looking to automate your home, the two platforms are similar enough that you should pick whichever assistant you prefer -- either way, your smart home devices will finally work better together.